Mice live below the city, and bears live above ground. Mice are scared of bears, and believe that bears will eat them. Bears are scared of mice, because… well, I guess just because mice are scary to them. They probably wouldn’t have any interaction with each other, except for the fact that mice often lose their teeth, and bear teeth make great replacements. Young mice are sent above ground to scavenge replacement teeth. One young mouse, Celestine, gets trapped above ground. 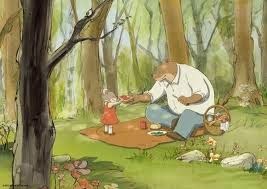 She is discovered by a bear named Ernest who has just awoken from hibernation. He is very poor and very hungry. Through quick thinking, Celestine becomes his first friend instead of his first meal, but neither the society of mice nor the society of bears are prepared to accept their friendship. 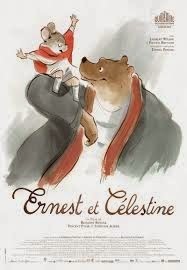 Although Ernest and Celestine mostly have a friendship, at the end of the film, Ernest recounts the story of his relationship with Celestine, and he edits it to make it sound like an adoption story. When viewed retrospectively as an adoption story, the film seems to show two cultures opposing a crosscultural adoption, but finally coming to accept it when they see that it helps society rather than hurting. Celestine appears to be raised in an orphanage. She is ostracized for being a friend to Ernest. Although he tries to send her away, she says, “I’m all alone. Nobody loves me and I don’t have a home.” He eventually embraces her. Ernest and Celestine eventually develop a mutually nurturing relationship. It’s not a perfect picture of adoption, but it is nurturing, cute and heartwarming. 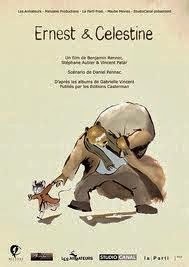 Ernest and Celestine each express that their desire is to live with each other forever. 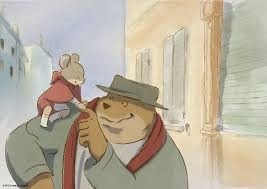 Ernest and Celestine are able to develop a mutually nurturing, positive friendship with each other, even though they are from different cultures. Ernest and Celestine eventually win societal permission for their friendship, but only after they perform acts of heroism. When Ernest initially finds Celestine, she is in a trash can. One character briefly appears likely to eat another. A grandmotherly figure tries to scare children in to obedience with nightmarish bedtime stories. 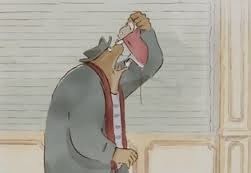 Ernest and Celestine seems to be a generally kid-friendly film. It is animated in a style that reminds me of fairy tales. It is a heartwarming story, and scenes of peril are quite mild and frightening moments are limited to only a few. It’s possible that some young children will be scared by the grandmother-figure’s bedtime stories. The crosscultural adoption connection is both vague and positive, which makes me think that triggers are unlikely, but that children may be able to take positive messages away from the film. This is one of my recent favorites. It was also one of the films nominated for Best Animated Feature in this year's Oscars, along with Frozen, The Croods, Despicable Me 2, and The Wind Rises. Have you ever been teased for having friends or family who are different from you in some ways? How do you feel about the teasing? What parts of the teasing are untrue? 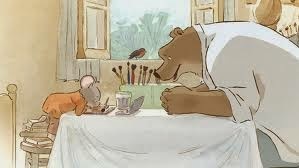 Why were Ernest and Celestine scared of each other? Were their fears true? Have you ever been scared of something that turned out to not be true? How would you tell your own adoption story? Spend some time writing and/or illustrating it together. Want to know when more movie reviews are posted? Like Adoption At The Movies on Facebook or Follow Us on Twitter.